The New York Times digital edition is available for all students and faculty at Hope College. To get access, Hope users will need to create individual logins at this NYTimes.com site and must use their 1Hope credentials to create an account. Follow the instructions to claim your pass. A list of frequently asked questions is available at the bottom of this post. The online version includes not only the same articles, text and images that appear in the print edition, but also an array of additional still images, videos, audio and data content. About the only thing not included in the digital version is the crossword puzzles. The content is enriched by inclusion of longitudinal data from syndicates and data sources such as Thomson Reuters. The subscription also includes free access through the NYTNow iPhone app. The library is interested in how access to the New York Times might be used within the curriculum, something that the NYT has been interested in as well. Given our emphasis on becoming more globally engaged and increasing student gains in writing and critical thinking, how might the NYT be used creatively within the classroom? Ideas for incorporating the New York Times into nearly all disciplines can be found on the NYT Classroom Ideas website. Our subscription to the NYT digital edition was brokered by the Center for Research Libraries. CRL and academic libraries have an interest in preservation of the NYT, which is currently only being archived by the New York Times itself. No other major news organization is investing in data journalism and data analytics to the same extent, suggesting that the online NYT will become an even greater resource for scholarly research in the future. The digital edition is highly searchable and allows users to search for content going back to 1851. In addition to keyword searching, users will have access to the TimesMachine, digital replicas of every issue of the Times published from 1851 to 1980. Users can browse page by page and see articles, photos and ads as they originally appeared in print. I already have a NYTimes.com digital subscription. What should I do? NYTimes.com does not permit a double entitlement. If you have an existing paid NYTimes.com subscription, you are not eligible for an Academic Pass. You should continue to access the Times via your own subscription. The New York Times Academic Site License has some restrictions that your personal subscription maynot have. Consider the options carefully before deciding one way or another. Site license access does not include the NYTimes.com tablet apps. At this time, access to articles from the date range 1923 to 1986 is limited is limited to 5 articles for the 364-day period. Yes, as long as you have registered using your campus domain .edu e-mail address and obtained your Academic Pass. There are mobile apps for iPhone/iPod Touch (IOS 5.0+), Android (OS 2.1+), and Windows (7.5 O.S.) phones; these are included as part of the Academic Pass. Mobile apps for tablets are not part of the Academic Pass. However, you can access the NYTimes.com mobile site (mobile.nytimes.com) or Times Skimmer (nytimes.com/skimmer) using your smartphone or tablet running one of the above operating systems. You can cancel your digital product at any time by calling Customer Care at (800) 591-9233. For international customers, please e-mail us at help@nytimes.com. Group Subscription billing cycles and terms of cancellations may differ and are governed by the terms set forth in the Group Subscription Purchase Order. If you cancel within the first 11 months, your access and other benefits will end immediately and you will receive a refund prorated to the day. How can I solve a problem accessing an NYTimes.com Academic Pass? Hope College digital image collections are now accessible through 1Search. Keywords can be used to find your topic related to Hope College history. You can choose “Image Collections @ Hope College” under the “Library Location” facet to limit your results to only the images from our digital repository. Here’s an example of a search using the Myron Van Ark postcard collection. Image Collections @ Hope College features rare and historic materials from the Hope College Libraries and Archives. These unique collections document the rich history of Hope College, which was chartered in 1866. Items cover a broad range of topics, including school traditions, historic buildings, programs, and more. New York Times Digital Edition Now Available! Access to the New York Times digital edition is now available for all students and faculty at Hope College. The New York Times, published since 1851, is the largest metropolitan newspaper in the United States. The online version includes not only the same articles, text and images that appear in the print edition, but also an array of additional still images, videos, audio and data content. About the only thing not included in the digital version is the crossword puzzles. The content is enriched by inclusion of longitudinal data from syndicates and data sources such as Thomson Reuters. The subscription also includes free access through the NYTNow iPhone app. To get access, Hope users will need to create individual logins at the NYTimes.com site and must use their 1Hope credentials to create an account. Follow the instructions to claim your pass. Posted on April 15, 2014 April 17, 2014 Author Kelly JacobsmaCategories Databases, Digital ToolsTags New York Times, NYTLeave a comment on New York Times Digital Edition Now Available! Whether you’re studying for the GRE or preparing for a professional exam, LearningExpress Library is available to help you. Utilize the Learning Centers to take practice tests, exercises, learn new skills, and prepare yourself for a job. In addition to test prep, LEL has tools to help with your resume, job search, and interviewing skills. There are interactive tutorials available to help you build your knowledge of popular software, like Adobe products, Microsoft suite, and more. Create an account for free today to get started. Have you ever visited the Library of Congress online? Or what about Holland’s own Joint Archives? What if you could find all the online holdings of these two very different institutions in one place? That’s where the Digital Public Library of America comes in. 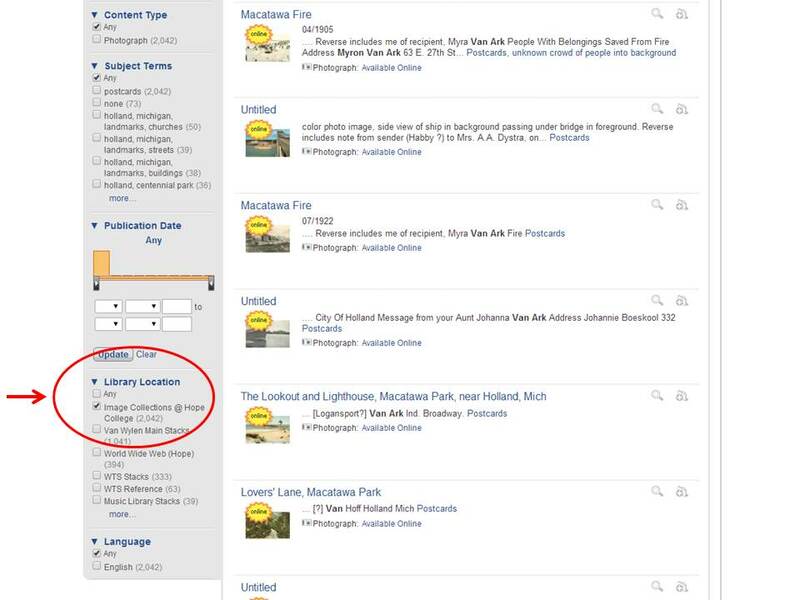 On April 18, 2013, the Digital Public Library of America launched a beta version of their discovery portal. The portal provides access to millions of items from archives, libraries, museums, and cultural institutions around the country. DPLA serves as a platform for digital collections from places as small as local archives to as large as the federal government’s holdings. 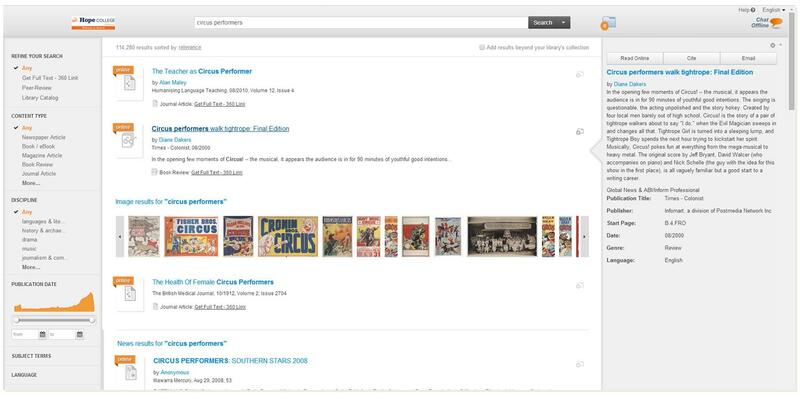 The aim of the DPLA is to make what’s already openly available easier to access and discover. In addition to general searches, users can explore by date, place, or exhibition. Of the 2.4 million records available, you can find letters by George Washington from the National Archives, a French Book of Hours from the University of South Carolina, or historic photographs from the Nicollet County Historical Society in Minnesota. Having all this information in one place makes primary source research easier and more accessible. Browsing the collections can also trigger new research ideas, not limiting students to just the local archives. No need to travel to see some of the greatest collections in the country! For now, the DPLA only includes items in the public domain; however, there is the possibility for expansion in the future. The main priority right now is to establish a platform that provides support for already digitized collections. To find out more about DPLA, check out John Palfrey’s article in Library Journal, or DPLA’s FAQ page.